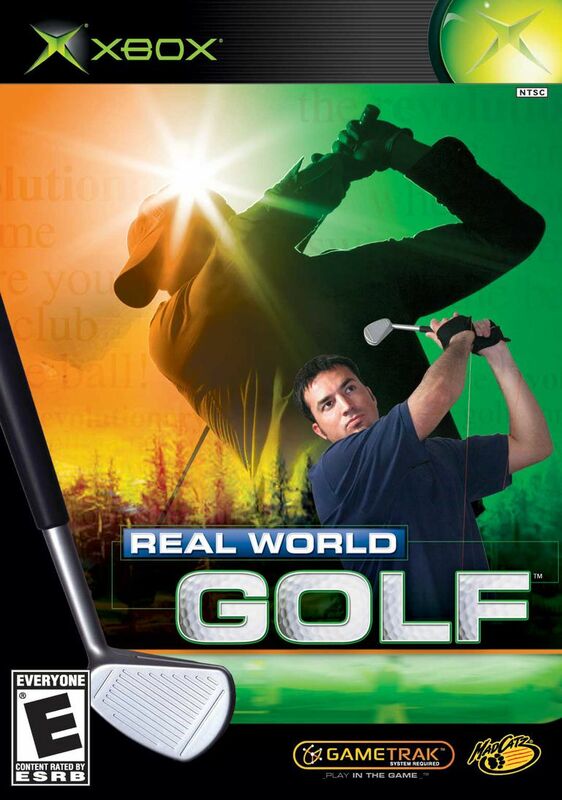 Real World Golf from MadCatz is the only golf game on the market that actually lets you take full swings in the real world and translates them into what happens in the video game world. It isn’t the prettiest or most feature-rich golf game for the Xbox, but the golf you get to play is some of the best around and that is what is important. Whether you are an experienced golfer or a complete novice, Real World Golf is very enjoyable and worth the $70 investment. Update: Despite new technology like Kinect (Tiger Woods PGA Tour 13, Kinect Sports 2), the Wii Remote, and PlayStation Move, Real World Golf is still probably the most accurate golf sim ever made. Even better, you can find it for dirt cheap these days and if you still have an OG Xbox console around it is worth checking out if you're serious about your video game golf. The key to Real World Golf is the Gametrak system. You can’t play without hooking up the Gametrak, but that is fine because without it Real World Golf is pretty average. With the Gametrak, though, the game perfectly mimics your real world swing and translates it into your onscreen avatar smacking the ball on your TV screen. The Gametrak is made up of a heavy base unit with two retractable wires that clip onto a set of special gloves, a foot pedal so you can select menu items, and a small plastic golf club so you don’t look like a doofus when you play. Your swing is determined by the movement of your hands and arms which is then measured in the base unit. It all seems kind of complicated and intimidating at first, but once you get it all hooked up and take your first swing and realize just how good of a simulator this is all of the fear goes away. In practice, the Gametrak system works surprisingly well. It can tell when you hit too thin or too fat as well as whether you hit a hook or a slice. You can use all of this sensitivity to your advantage, of course, to bend shots around trees or put topspin and backspin on a ball when you need it. It really is amazing just how accurate it is. This is a golf simulator through and through, so having real-world experience is a definite help when you try to play. That isn’t to say you won’t have any fun if you are a novice, though, because Real World Golf is so easy to pick up and play and, most importantly, fun, anyone can play it and have a really good time. I’m no golf expert, but I do have one tip for novices: Look at the golfer on the screen and copy his stance as close as you can. Holding the club correctly, standing correctly, and keeping your arms straight during the swing will help immensely. Golf isn’t so much about how hard you can swing the club as it is using the right technique, so keep that in mind before you grip it and rip it. The actual game underneath the fancy peripheral isn’t too spectacular, but it doesn’t have to be. The whole point here is that you are taking real full swings and not how pretty the course looks. There are ten unlicensed courses based on real European courses and each one has a different feel. You’ll also find a driving range (complete with a parking lot full of cars to hit…), a putting green, and a chipping green so you can practice. I highly recommend using these practice modes as well as going through the tutorial at least once. It really will help you. You can play four-player multiplayer where each players has their own profile (and their own unique swing calibration) and you switch off when each player completes a hole. It is sort of a hassle to take the gloves on and off all of the time for multiplayer, but you get 4-5 swings in before you have to switch so it isn’t too bad. All in all, the feature list is pretty decent, but it obviously can’t compare with the wealth of options in Tiger Woods. Not having real-world golfers isn’t an issue since YOU are the real world golfer here, but I would have really liked to of seen some licensed U.S. courses to play on. It would have made things just that much more fun. Graphically, Real World Golf really fails to impress, but it doesn’t really matter in the end. The textures for everything are bland and the player models are really basic. The animation is really good, however, and it is very cool to see your swing and movements perfectly translated onscreen. The sound is similarly bland. The sounds of golf — the thwack of a driver and the rattling of a ball when it hits the cup — all sound just right, but the elevator music soundtrack and commentary leave quite a bit to be desired. Real World Golf is one of the best golf games for the Xbox. You get to hold a club in your hand and take full swings and play through a real round so how can that not be fun. It really is as close to real golf as you can get without actually going outside. Whether you are a novice or an experienced golfer, Real World Golf has something to offer by both teaching you how to play as well as letting you practice and hone your swing. It also has to be mentioned that playing a full round or two in RWG provides a surprisingly good workout. Taking 150-200+ swings is plenty for you to work up a sweat and make you a little sore the next day. Real World Golf is fun for anyone and everyone and it is an accurate golf simulator that can and will improve your game in real life. The only drawback is that the set costs $70 which puts it squarely in the realm of golf fanatics or wannabe golf fanatics only rather than casual gamers. If you do decide to drop the cash for it, you won’t be disappointed. I highly recommend it.